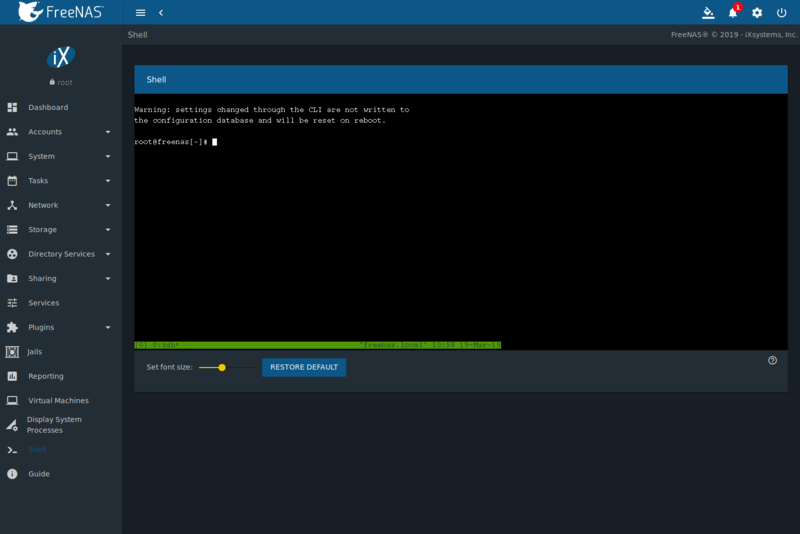 Beginning with version 8.2.0, the FreeNAS® web interface provides a web shell, making it convenient to run command line tools from the web browser as the root user. The link to Shell is the second entry from the bottom of the menu tree. In Figure 18.1, the link has been clicked and Shell is open. The prompt indicates that the current user is root, the hostname is freenas, and the current working directory is ~ (root home directory). The default shell for a new install of FreeNAS® is zsh. FreeNAS® systems that are upgraded from an earlier version will continue to use csh as the default shell. The default shell can be changed by clicking Accounts ‣ Users, clicking  (Options) of the desired user, then selecting Edit. Choose the desired shell from the Shell drop-down. The Set font size slider adjusts the size of text displayed in the Shell. Shell provides a history of commands used. Use the arrow keys to see previously entered commands and press Enter to repeat the command. The keys Home, End, and Delete are also supported in the shell. The shell also provides tab completion. Type a few letters and press tab to complete a command name or filename in the current directory. Type exit to leave the session. Web interface menus cannot be accessed while using the Shell. To access a prompt while using the web interface menus, use tmux as it supports multiple shell sessions and the detachment and reattachment of sessions. Not all Shell features render correctly in Chrome. Firefox is the recommended browser for using Shell. Most FreeBSD command line utilities are available in the Shell. Additional troubleshooting utilities that are provided by FreeNAS® are described in Command Line Utilities.